Power Steering Belt Won't Stay On? 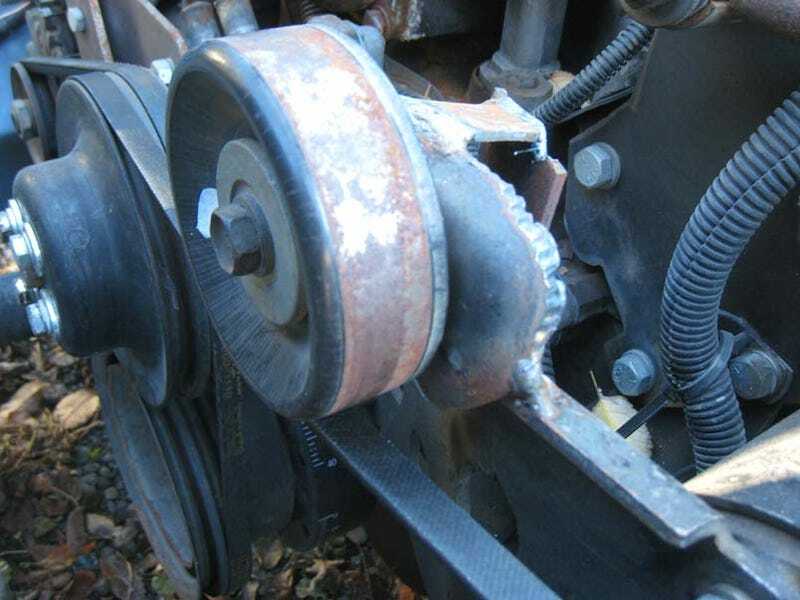 Junkyard Serpentine Idler Pulley To The Rescue! Since many of our cheapskate thrifty readers appreciated the tip about cheap rear-battery cables from junked BMW 325s, here's another nearly-free trick we discovered while preparing the V8 Volvo for the next race. The Black Metal V8olvo had just one mechanical failure its first time out: the power steering belt came off the pulleys a couple times during the course of the race. That's because we were using a grab bag of scrounged accessories on '84 Volvo DL's 1986 Ford 5.0 engine, and… well, those of you who work on small-block Fords know all about the maddening lack of compatibility between components used on various flavors of the Windsor engine. After the race, we messed around with spacers, shims, new brackets, and so on, and got the pump's pulley more or less in the same plane as the pulley on the balancer, but we needed insurance. Next stop, the junkyard! I grabbed an idler pulley off the serpentine-belt-equipped V6 in a mid-90s Chrysler Concorde and brought it back to Hellhammer. About 10 minutes later, this Space Shuttle-grade rig was in full effect. All it does is push down slightly on the outside of the power steering belt, preventing it from flying off the pulleys at high speed. Works great!